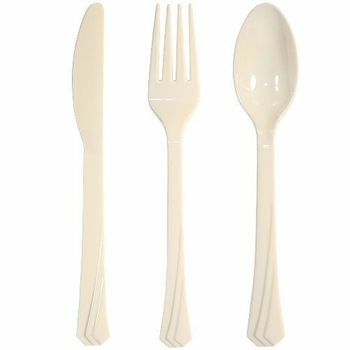 Home»Plastic Cutlery»Ivory Plastic Cutlery 51ct. 51 Count Ivory heavy duty plastic cutlery. The design on the handle is ////, that match our plates. They are perfect for any wedding or party. Other colors are clear, white and gold. Ivory Plastic Knives Heavy Duty Cutlery 51ct.